Weiye Yin is a concept artist with over ten years of experience. 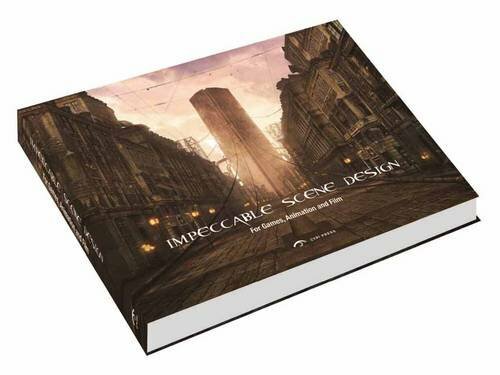 He draws a variety of subjects but this book focuses on scene design, creating believable backgrounds that serve as a backdrop for stories in games and films. The book is split into three parts. First is the introduction to scene design and how it differs from just painting background art. Second part looks at the principles and procedures. Third is a collection of demonstrations that look at how a few scenes are developed, namely Landscape, Environment, Urban Architecture, Atmosphere and Still Life. It is a good introductory guide to scene design. You get tips on dealing with composition, lighting, colours, adding details, effects, doing drafts and even on dealing with clients. The step-by-step demonstrations talks in depth about the conceptualization process, the considerations when handling different types of projects. Two of the case studies presents some tips on using 3DS Max for scene designs. Most, if not all, the examples are digital paintings, some with the use of 3D software. It's more recommended to intermediate and advanced artist who already know the basics of painting and want to apply that knowledge to a different field. HI, have read the book? Any specific area you're looking for? Impeccable Scene Design covers more of the conceptual design. It is more theory based and talks mainly about the different aspects to focus on when creating a scene (or background), stuff like perspective, details, colours, props in the scene. It more on what to draw, not how to draw. Setting the Scene covers mainly the history and evolution of animation layout. Hi Parka, do you have any reccomendations for a beginner's book on painting? I've just bought James Gurney's "Colour and Light" - would this be a good place to start? By no means a bad book but I have this and in my opinion the book does try a little too hard to instill a very "procedure" based approach to concept design as though there was a "correct" way to do things, for example the author advocates working a grayscale and coloring it later on which is not without its problems and very often leads to anemic and unnatural colour, also note that the worlds best digital artists aka Craig Mullins don't do this. He also gives a star based ranking to ways of doing things, for example drawing an architectural scene freehand is given 1/5 stars i see freehand architecture all the time, indeed the best work is often freehand and the mediocre stuff is photobashed and propped up by block models, so no idea what the logic was there. I was not blown away by the quality of the examples either, i would consider them serviceable at best. In my opinion the only way a book like this could work is to take many world renowned artists, have them explain their methods and let the reader decide what they want to take from it. The book was published by the "Chinese youth press" which i have no idea what means but sounds state sponsored to some degree, i disagreed with the dogmatic approach to ways of doing things with little explanation of the reasons why, in other words there was no logical argument for certain methods. You should post your review on Amazon.